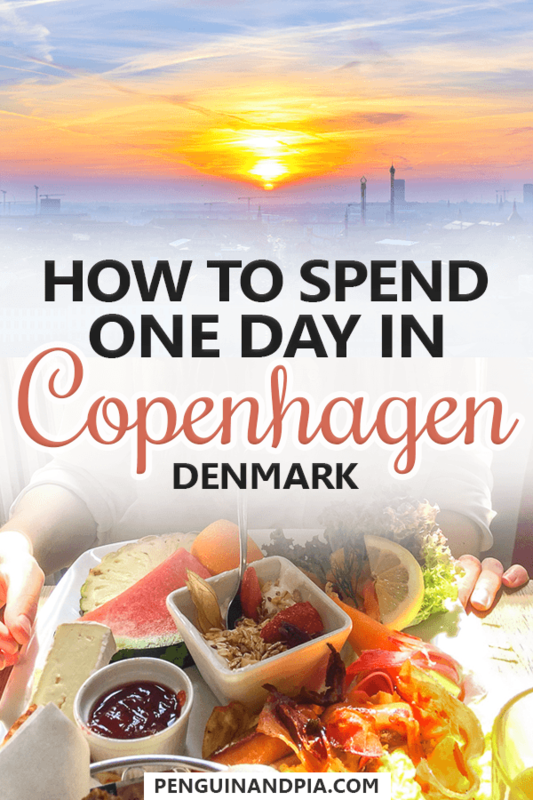 Food, Drinks, and Sights – Here’s One Day In Copenhagen! So, you’re in Copenhagen. Maybe you’ve got a half day stopover or maybe you are passing through from Germany or Sweden and only have an hour? Whatever your reason, there is plenty to do in Copenhagen in a day – and we are here to help you make the most of that day! Lisa lived in Copenhagen for a few years so it’ll always hold a special place in her heart. Eric visited her a few times, but has also explored the city before we even met. He once did a whole trip just exploring some Nordic capital cities. 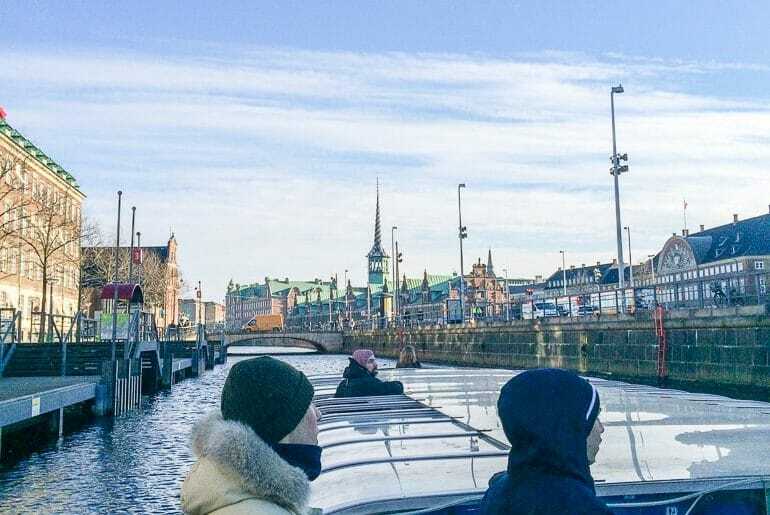 So, whether you’re looking for ideas on what to do in Copenhagen on a sunny day or a winter one, we list off the things that are a must see in Copenhagen in 1 day. 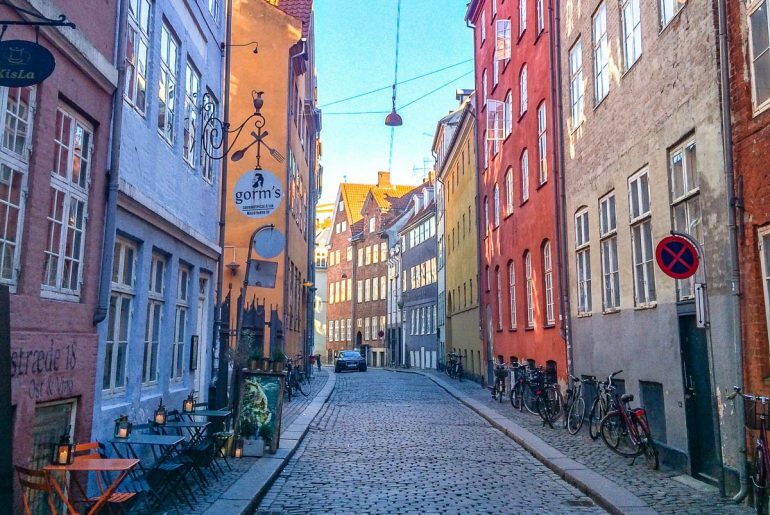 Consider this your perfect Copenhagen day trip itinerary! If you do end up staying the night, you can check here for accommodations in Copenhagen. Check out The Good Morning+ Copenhagen Star for a hotel and Copenhagen Generator for a hostel (both in the city centre) close to all the best attractions. We also have a longer Copenhagen accommodation guide, if needed! Just so you know, we plan to write a 2 day or longer itinerary very soon! You can have The Little Mermaid all to herself in the early morning. If you are waking up in Copenhagen or getting in very early, you can get in a nice morning walk along the water to wake up. There are plenty of coffee places in the city to stop along the way (should you need a little caffeine kick). 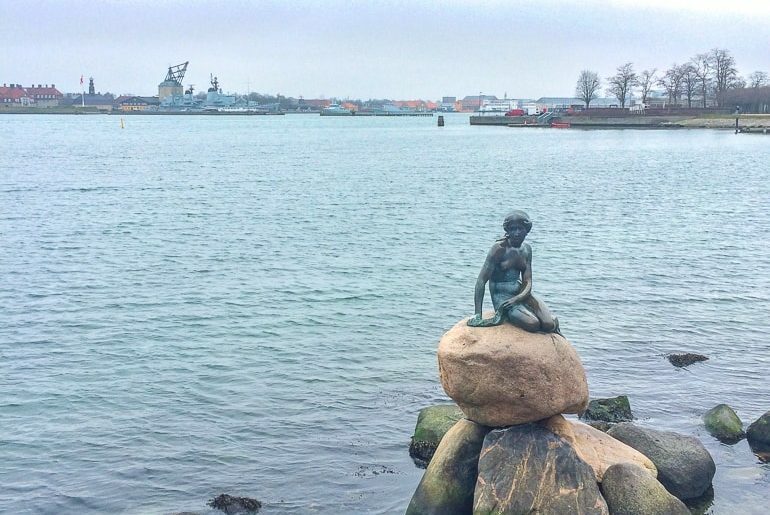 A good walk north of the city centre along the harbour will bring you face to face with one of the most iconic attractions in the city: The Little Mermaid. This little bronze sculpture of Danish author Hans Christian Andersen’s famous fairy tale character was created by sculptor Edvard Eriksen. Since 1913, the Little Mermaid has sat perched on her rock just down from the sidewalk at the shoreline. She’s cool to see – and if you go early enough, you might be able to catch her without a massive crowd of people huddled around her taking photos! 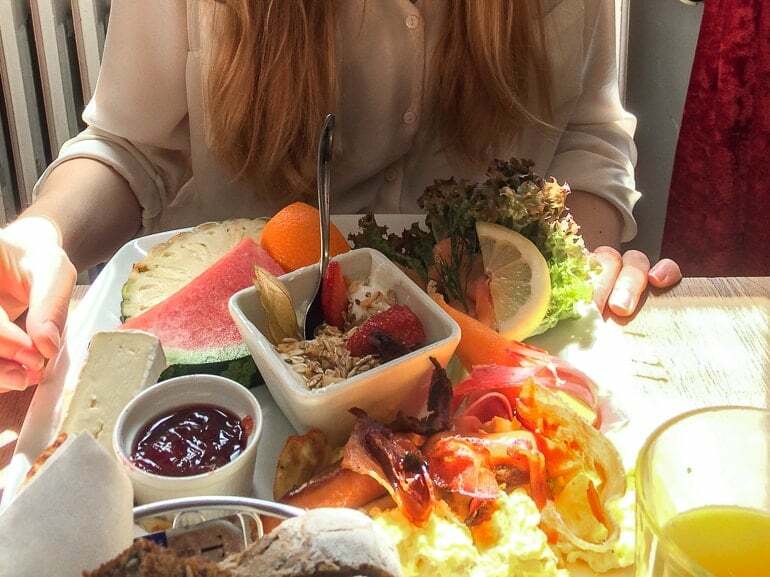 Brunch at Paludan was beyond delicious… brie, fruit, bacon, everything! Once you’re walking back to the city centre, you will probably be getting hungry. Time for a big brunch. Tucked away in the busy city centre where lots of shops, bars, and cafes are – you’ll find Paludan. When you walk in you might think you are in a library and you wouldn’t be wrong! This library and cafe is full of books, a very cool atmosphere, and great food and drinks.. We went for brunch there and it was absolutely delicious – you can see the photo above. We both got a massive platter which had a little bit of everything on it! The menu is pretty good and offers loads of different options from sweets to savoury items. It’s also a pretty affordable option compared to some other popular Copenhagen brunch sports. Just remember you have to seat yourself, go to the counter to order, and take a number. You take the drinks back but they will bring the food. Often, students of the nearby university study there so it can be busy with people nested in for a few hours of hot drinks and work time. We’re sure you can find a spot. You can check out the official website and menu here. You might find this street – Magstræde. Be sure to take a photo! In the morning, after you have fueled up, you should see as much of the city as you can. Luckily, there are plenty of ways to do this depending on your energy level, mobility, and style. You can rent a bike – this would be the most Danish way to see the city. The biking infrastructure is among the best in the world so you can feel safe knowing that bikes matter in Copenhagen! Biking is also faster than walking and a day bike rental is not too expensive. You can check out rentals all over the city or save the hassle and join a bike tour. You can also take the metro/S-train between a few stops if you want to explore the inner city but have limited mobility/time. Here’s a link to the Copenhagen transit website if you need it. Christiansborg Palace – Danish Parliament. Only do the inside, not the tower (yet)! Museums and other attractions – there are loads more! If you wanted more of a guided tour so you didn’t have to plan that much on your one day touring around Copenhagen, you could do a half day cultural walking tour. This allows you to maximize experience with a local Danish guide for some of the one day you are in Copenhagen! All the touring will make you hungry again. Time for lunch! Copenhagen (and Denmark in general) is known for its cuisine – with Smørrebrød a thing of beauty. This “open faced” sandwich comes served many different ways and you should definitely try it out! A classic Copenhagen food market is a good way to do this. We’d recommend Torvehallerne as the place to go now. Located near Nørrebro in the city centre, this market is lovely, spacious, and very alive. There are plenty of vendors selling groceries items people buy for later or lunch items for eating right then and there. We used to go to Papiroen but it closed for them to open a new one called Reffen. It’s closed in the winter but definitely worth checking out in the summer months. We also used to recommend West Market which was the newest market in Copenhagen and we last visited. We had a great time – but apparently now it’s mostly closed down so we can’t recommend checking it out. The flat boat tour was definitely worth it! Now that it’s the afternoon, you need another activity to keep you busy. You have two options – see more things or get lazy in the park! It’s a tough choice. The first option we recommend for the afternoon is going on a flat boat harbour cruise. You see these boats leaving from Nyhavn and cruising the canals through the city. The flat bottom ones leave from two places: Nyhavn Harbour and right across from Christiansborg Palace. Eric did this cruise in the winter (early February) and still loved it. It wasn’t too cold at all to be outside but people did sit under the covered glass shelter to stay a little warmer from the wind. The guide was great and gave lots of interesting facts about the city. The other thing we would suggest is to go hang out and relax like a local in the King’s Garden – if it’s sunny. Located very much in the city centre, it’s easy to enjoy: just grab a few beer/cider or a bottle of wine, some snacks (at the food market), find some grass, and enjoy the sunshine. We once grabbed drinks and a fresh pizza (seriously) and enjoyed our picnic in the sunshine. You might even opt to walk around the park – which is beautifully landscaped. Choice is yours! The sandwiches were REALLY good! Okay, so you’ve enjoyed the afternoon but now it’s that awkward time between your afternoon activity and the time when you’re relaxing and getting ready for dinner. So, why not use it to relax and give your body what it needs? You might need a hot beverage to warm you up or you might need a smaller snack to tie you over until dinner. Whatever you are feeling, we have you covered. If you need a coffee and/or a small freshly made sandwich, we suggest going to Espresso Huset. Located right behind Christiansborg Palace, it’s a cozy cafe with loads of seating and great food/drinks. The location is also useful for the next activity! You can check out their Facebook Page here. Alternatively, if you find yourself a bit further away from the harbour (having been in The King’s Garden’s), you can stop at Krystal Sandwich on the way back to the centre. This TINY place is down some stairs from street level when you enter – and they do coffees, salads, and freshly made sandwiches, as well. 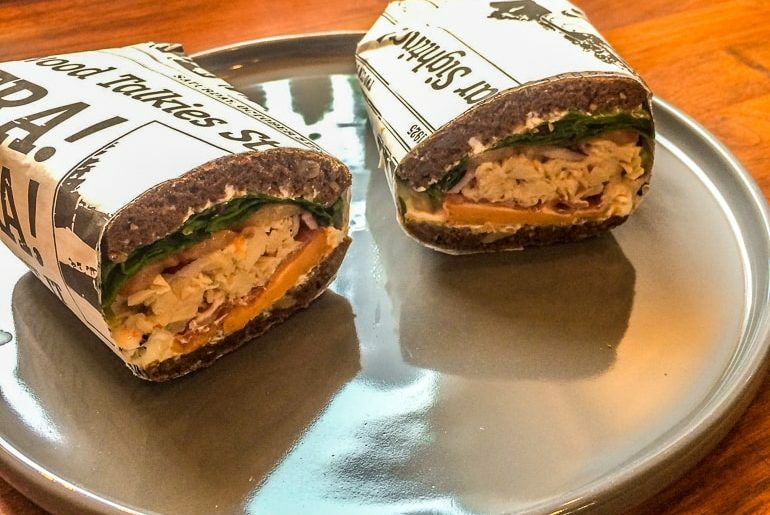 We had a chicken salad (pictured above) and it was very, very good. We also had coffees which was nice. You can check out their website here. 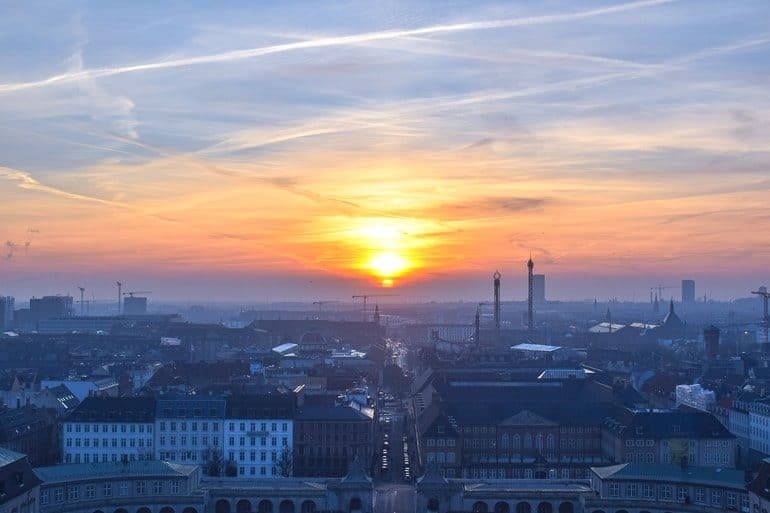 The sunset from Christiansborg Tower was breathtaking. Well, it’s the evening now. The day is winding down and the sun is setting. What to do next? We have two options for you. There is a reason we didn’t put “visit Christiansborg Palace” on the list of places to see during the day.. even though it may be tempting! Actually, you can visit the insides of the Palace during the day – but we’d suggest saving the tower for the evening! It’s free to go up the tower for amazing views of the city below. Its hands-down one of Eric’s favourite places in the whole city. Be warned, though – there might be a line to get through the metal detectors and up the tiny elevator. So, you should get in line early or scout the line in advance to make sure you time it right! Of course, this can be done in any season which is nice – but it’s nicer when it’s not cloudy! You can even eat dinner up there – but definitely book a place at the restaurant in advance! Here is the official website to check out tours and opening hours for the Palace. The other option we think might be good for an evening activity is to visit the grounds of famous Tivoli Gardens. Known as the second oldest operating amusement park it he world, (the first is Bakken – ALSO very close to Copenhagen! ), Tivoli is a magical place for all ages. You can choose to ride the rides or just enjoy a stroll through the grounds. It’s a beautiful place with plenty of green space that gets lit up with lights at dusk – that’s why we recommend going in the evening. It’s only open selectively during the cold months so be sure to check ahead. Here’s the official website for Tivoli! 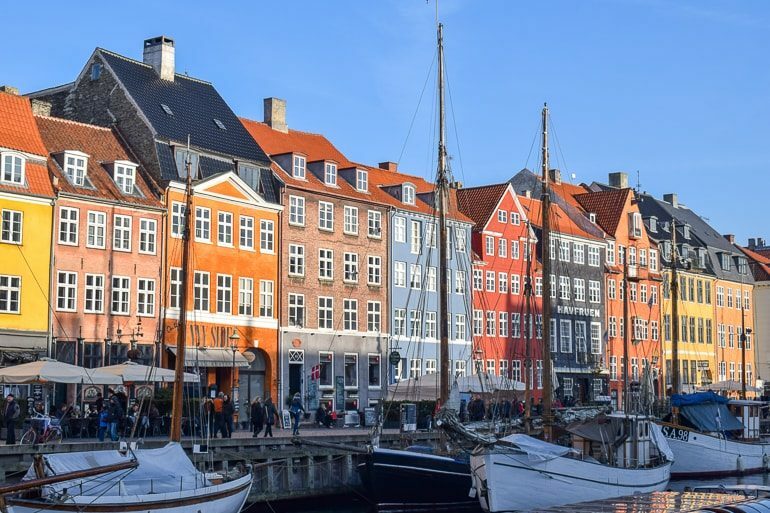 You can even eat at Nyhavn Harbour – but there are loads of other places! Now that you’ve enjoyed Tivoli or your time up the tower, it’s time for dinner! For this, we have two very good options – and both have vegetarian dishes, in case you were wondering. That said, there are SO many restaurants in Copenhagen you can find a good place anywhere in the city. Grillen Burger Bar is a very good place that does exactly what it sounds like: burgers! We went there one night while out for a wander (when Lisa lived in Copenhagen still) and the burger was excellent. We also had a side of fries which were really well done, too. Located in Nørrebro, this place is nothing fancy – and the place is pretty big. Just good food (and delicious curly fries). Here’s the website. They have a few different locations across the city, but we’d recommend the one below. Neighbourhood is a place that does very good pizza. Lisa has been before and that’s why it made the list. In fact, they do organic pizza and cocktails, so isn’t that a great combination?! There are two location in the city – Lisa went to the one in Vesterbro. She had a brie potato pizza and really liked it! If this sounds like it interests you, check out their website. You can even just stay here for drinks if you want. If not, we’ve got suggestions below! Ah yes, the evening is upon us. If you still have the energy (and you are still in the city at this point) then you should do drinks to polish off a perfect day in Copenhagen. We have two suggestions – both of which we really, really like! You choose between cocktails or craft beers! Kassen is a cocktail bar in Nørrebro right on the main street. We went for a friend of Lisa’s birthday and there was a great vibe there – we had a really good time! Cocktails were good and not crazy priced (for Copenhagen standards). You check out the website to see if Kassen is for you. It’s also conveniently located across the street from Grillen Nørrebro. Mikkeller Bar (the location Eric went to) is close to downtown/ Copenhagen central station. If you like craft beer, this is the place for you. Mikkeller is actually a Danish company (and not so much a singular brewery) that works with local brewers to create their own brews under the Mikkeller name. This means that no two Mikkeller location (in the world) will have exactly the same beers on tap! This location is down some steps and super cool with great vibes, drinks, and people. If you want to learn more about Mikkeller Bar, you can visit their website! And there you have it, our sample itinerary for one day in Copenhagen. There are obviously many substitutions that you can make for places to eat or activities but we wanted to tell you about some of our favourites! 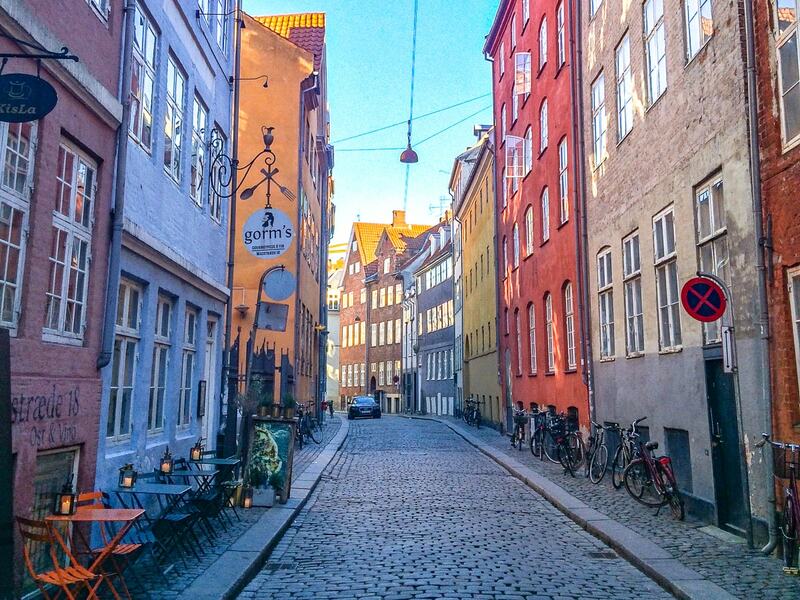 If you end up in Copenhagen for one day, let us know how it goes and what you get up to!